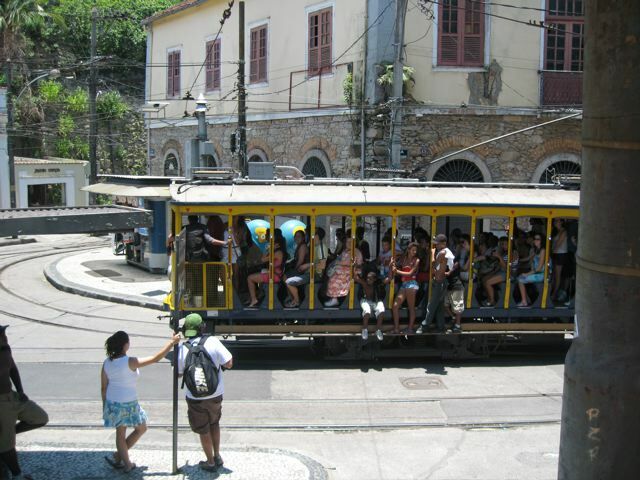 The title photo is of a tramcar still in use today – in Santa Teresa, Rio de Janeiro. All service on the line has been suspended since 2011, as a result of a serious accident on the line, but a new fleet of 14 tramcars has been built, the tracks are being relaid, and reopening was projected for 2015, in time for the 2016 Summer Olympic Games. For more news see the Rio Times article. Tramcars are now coming back to major cities, but under another name, and with much modernized technology. They are now called LRT – or Light Rail Transit, and in Brazil the system is called VLT – Veículo Leve sobre Trilhos. It is a closed car, in contrast to the old open-sided trams, and of course looks sleek and modern. It also does not require overhead cables to pick up the power, but has a third rail that runs underground. It is lower to the ground, making entry easier, and is comfortable and air-conditioned. In Rio de Janeiro the system will be limited to the downtown area, connecting the Santos Dumont airport to the main bus station at the start of the Avenida Brasil, via the revitalized Rio Port region. There are various side circuits, covering most of the older part of the city center. One track will go between the Cidade do Samba and the English Cemetery in Gamboa, also covered in this blog.